Filianism (the "Daughter Tradition" – from filia, daughter) is a religion that is sometimes considered to have started, or taken its current specific form, in the 1970s, since that is when it first became publicly known. Its first recorded modern appearances were in Britain, although some have postulated a Greek or Asian origin for its Scriptures and philosophy. • Worships God in exclusively feminine form. • Sees God as both Mother and Daughter. • Is trinitarian (but in a manner very different from Christianity). • Is monotheistic (but in the same sense that Hinduism is – see more here) and has a strong angelology, focusing especially (but not exclusively) on the seven "planetary" angels, who are all feminine in form. • Has a distinct body of Scripture recognized by all Filianists (although several slightly differing versions exist). • Has a complete thealogy, philosophy, and world-view. • Like Déanism, to which it is related (see more later), Filianism uses the term Dea for God and does not use the word "Goddess". Filianism is not an Abrahamic religion. Filianism is not in any way based on Abrahamic faiths of Judaism, Christianity, or Islam. It does not use any version of Abrahamic Scripture. The threefold nature of the Mother God long predates Christianity, and the Trinitarian aspect of Filianism is closer to the Vedic Trimurti than to the Christian Trinity. The "Dharmic" rather than the "Abrahamic" religions are actually more typologically similar to Filianism, despite superficial appearances. Filianism is a religion of the Cosmic Harmony (Thamë). However, Filianism does not actually belong to either group. Filianism is not an earth religion or a lunar religion. In Filianism the Mother is clearly Solar, while the Daughter is Lunar. Respect and gratitude toward the earth and its beauty is fundamental to Filianism and enshrined in its Scripture, but the earth as such is not regarded as a deity. The relegation of feminine Deity to lunar and chthonic domains is seen as an aggressively patriarchal redaction particularly prominent in the Western Classical cultures. The embrace of this demotion by some feminists is considered ironic. Much Filianic symbolism is solar and heavenly rather than lunar and earthly. Filianism is not "New Age". In particular, it does not accept "Spiritual Evolution" and other hybrids of popularized physical science projected onto the so-called "spiritual" (actually psychic) plane. The current age is in fact the Age of Iron, or Kali Yuga and is by definition the least spiritually enlightened era of the historical cycle. It has often been noted that the "new spiritual revelations" of the past century and a half can generally be dated by the pop-science current at the time of their "revelation". Filianism does not use the term "Goddess" and therefore is not regarded by its followers as a "goddess religion". The term "Goddess" is seen as a diminutive of (implicitly masculine) "God", and sometimes considered to imply the existence of masculine gods. Filianists use Dea, and sometimes simply God, as the term for God the Mother. Filianism does not see Dea in "psychological" terms. Unlike some feminist Goddess-religions, Dea is not seen as an aspect of the female psyche, a projection of women's consciousness, or anything of that order. Dea is God, pure and simple. She created, and was not created by, humanity. Filianic belief does not include masculine gods. While Filianism respects other religions and does not claim to be "exclusively true", within its own economy there is no "father god" figure. All the Janyati (Angels) are likewise feminine in form. Filianism and Déanism are often mentioned together. The term Déanism means belief in and worship of God (Dea) in exclusively feminine form. The Faith of Our Mother God consists in the acceptance of our Mother-Creatrix as the one Supreme Being, the Source and Origin of all that is, the One without a second, upon whom the existence of anything whatever is absolutely dependent. To know this and to love Her – or even to wish to love Her – is the whole of our religion in its essence. The term Déanism was intended to define an absolutely thealogically minimal devotion to the Mother. Its relation to Filianism, however, may be seen by the inclusion of this purely Déanic preface to the Filianic Scriptures. The preceding section on what Filianism is not also makes clear the close relation of Déanism and Filianism. Déanism also is not any of the above things, as even the minimal statement in the Gospel makes clear. Déanism is not Abrahamic, not an earth religion, not "New Age", not a lunarist religion, not a psychological-goddess religion, and does not include a male/father god element. When you exclude all these factors, all that is left, at least in the West, appears to be Déanism and Filianism. Filianists, indeed, regard themselves as Déanists. An often-used formula is: "All Filianists are Déanists, but not all Déanists are Filianists". However, most Déanists have at least some relation to the Filianic faith, and in practice the separation between the two is less clear-cut than it might seem. To understand this, we must realize that Déanic/Filianic thealogy is much less "literalist" than Christian theology. It is understood that the three aspects of Dea could be seen as "functions" rather than "persons". The Mother is God with form (saguna brahma), the Dark Mother is God beyond form (nirguna brahma), while the Daughter represents the saving aspect of Dea as seen in such figures as Quan Yin, as well as the world-preserving Harmony. The extent to which one sees the threefold division as literal "persons" is considered relatively unimportant (since God is not actually a human person in any case), which is why a Déanic prefatory paragraph is considered entirely proper and appropriate for Filianic Scripture. Déanists may well regard the Mythos of the Daughter as simply inspired "stories" illustrating certain aspects of the Divine, and Filianists, on the whole, do not object to this interpretation (see a Déanic view of the Scriptures). It is probably the case that pure Filianists and pure Déanists are relatively few, and most believers fall somewhere between the two. This religious flexibility may seem surprising to people raised on the theological literalism of Western religion, but it is not actually uncommon outside the Abrahamic sphere. In order to grasp this we must understand that the story of the Daughter, like that of the Creation, is myth and not history. The Christian faith rests on certain historical events which must have either happened or not happened. There is no material history that forms an indispensable part of the Filianic faith. The Creation is not seen as "fact", precisely because it is the story of the beginning of time, and while it is told as if it were a sequence of events set in time and space (because that is the only kind of narrative time-and-space-bound beings can understand), clearly it should not actually be regarded as either "factual" or "eventful". It is understood that there have been other Déanic Creation stories that are "factually" different but no less true. This could be confused with post-modern extreme relativism, but in fact it is the precise opposite. Myth is not less true than history, but more true. History tells of things that might or might not have been. Myth tells of those things that cannot not be. History tells of chance events within the flux of time. Myth tells of the very foundations of being. Thus, as opposed to post-modern relativism, which questions the very existence of truth, both Filianism and Déanism are founded on the concept of Absolute Truth, which transcends the inherent uncertainties of material existence. The threefold nature of Dea is one way of understanding Her, and is found in many pre-patriarchal cultures. Even pure Déanists who see Dea as One can recognize Her different Aspects, while of course the threefold nature of Dea does not deny Her Oneness. For these reasons, the two approaches to Dea may be seen as complementary rather than opposed, and to be largely a matter of spiritual practice. The extreme oppositions over points of doctrine found in Abrahamic religion (especially Christianity) are the product of an over-literalization of mythos. Filianic cosmology is based on the idea of Divine Harmony or Thamë. Thamë is both a Janya (represented in our solar system by the planet Jupiter) and the Harmony of Being itself – the Music of the Spheres. The word Thamë has been compared to Hindu/Buddhist Dharma (Pali Dhamma), but may equally be compared to Themis, the ancient Greek feminine deity of the planet Jupiter and all that it rules. All three words are fundamentally connected. It is Love that holds the drop of dew pendent upon a blade of grass, neither flowing forth in watery profusion, but swelling within the unseen urn of its brief harmony. While some have compared the Filianic trinity to the Christian Trinity, the resemblance is in fact very limited, and in some ways a better comparison is to the Hindu Trimurti of Brahma, Vishnu, and Shiva, the Creator, Sustainer, and Destroyer of the world. You shall command the movements of the waters, and the wind shall be Your servant. The seasons of the earth shall You control, and all the times and seasons in the lives of My creatures. Every soul on earth and in the heavens shall be given into Your care, and the highest stars of the firmament shall know You as their Sovereign. The Daughter is thus the Source of the Divine Harmony (Thamë) itself. The world is sustained in every moment by Her hand. Truly, all the cycles of the times and the seasons; all the rhythms of the soul and of the mind and of the body: truly all these flow from the love of our Lady the Maid, that creation may not decompose, each several member flying away into black eternal chaos. The Dark Mother is called "dark" not because she is in any sense "bad", but because she is by definition Unknowable. "Her Name has not been spoken on this earth". Filianism is not associated or affiliated with any other faith (other than Déanism). Similarities to other faiths have been noted, and this is natural since ultimately Truth is one, and insofar as any tradition reflects Truth, it will also, in some respects, resemble other traditions that reflect Truth. Parallels can be drawn between any two legitimate faiths. A common parallel drawn is with Christianity, in particular because of the threefold nature of Dea. As the above section shows, the Filianic Trinity is very different from the Christian. In this regard it should also be noted that the worship of God the Mother has had a threefold form (the so-called "Triple Goddess") in many cultures from millennia before the advent of Christianity. The early Christian founder, St. Augustine, actually mocked the idea that the Magna Mater (Great Mother) could be both One and Three, before converting to the new patriarchal version of the same doctrine. The Sacrificial Deity is an important concept that is far from being exclusive to Christianity. Filianists in fact regard the sacrifice of Quan Yin as much closer to the Daughter, and many see it as the same Truth understood only a little differently [more on this]. Images of Quan Yin are common among Filianists. The Filianic Calendar has some similarities to the Christian, but this is because the main Christian festivals are all based on earlier festivals that ultimately go back to the Mother Religion. Certain other parallels are more legitimate because they refer to exterior apparatus that has been used by Filianists and was consciously based on Western usage. The Filianic Creed, for example, is clearly modeled on Christian creeds and was constructed early in the life of the modern Filianic movement for the same purposes as Christian creeds – to provide a clear, concise, and devotional statement of what the Faith is and is not. Similarly, in some cases, prayers have been adapted from Christianity, images of the Virgin Mary (not regarded as the human Mother of Jesus, but as the providentially preserved image of our Mother God) and even adaptions of the Christian Rosary have been used by some Filianists. These, however, are external to the essence of the faith itself. 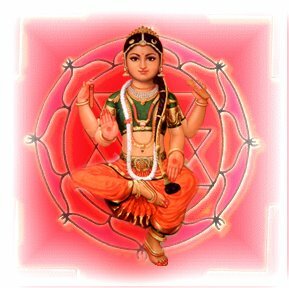 At the same time, images of Quan Yin, Sri Lalita, Sri Mahalakshmi, and other figures of Dea are regularly used. Buddhist chants such as the Om mani padme hum have also been used and Hindu-style rosaries (mala) have been used with traditional Filianic chants. Borrowings of outward forms in this way is not uncommon in the history of religions. It is a matter of personal devotional usage and certainly does not affect the doctrinal core of the Faith. Less publicized but actually more credible than the superficial associations with Christianity is the association of Filianism with Hinduism. A number of Sanskrit terms are used (we have used nirguna brahma, Atma, and others in this article). And core doctrines of Filianism and traditional Déanism are in fact far closer to Advaita Vedanta than to any Western or Abrahamic religion or philosophy. This has led some people to postulate an ultimately Indian or East Asian origin for Filianism. Some people have stated that all the names of the Janyati are actually Sanskrit (they do have a relationship with Sanskrit words, but also with other Indo-European words). What must be understood here is that the Vedic tradition is the only living tradition in the Indo-European world that goes back unbrokenly (though with major changes and adaptations, of course) to the Primordial Tradition. This means that there will naturally be more essential similarities between Filanism and the Vedic Tradition than there are with religions with historical founders in the patriarchal Age of Iron. Sanskrit is also the only Indo-European language with the vocabulary to express many traditional concepts. These concepts have long been lost or diluted by the Greek/Latin terminology of Europe, while the Intellectual language of the other European language-groups (Teutonic, Celtic, etc.) is lost in the mists of time. While Filianism has a rich vocabulary of its own, it has never been afraid to borrow from Sanskrit (and sometimes from Chinese or Japanese) when the long-debased languages of the West (which have, over centuries, oriented themselves increasingly to a materialist ideology) fail to provide adequate vocabulary. Parallels with Buddhism and Taoism are also occasionally drawn, and once again we would simply point out that Truth is Truth and will be found in all valid traditions. Less often, and usually for very superficial reasons ("they worship a goddess too"), Filianism is associated with modern paganism. In fact, Filianism has very little in common with modern paganism, Wicca, or related movements. For a fuller discussion on this, see Do We Worship a Pagan Goddess? Universalism: All beings – even devils – will eventually be saved "even to the last blade of grass". The idea that anything whatever can remain permanently separated from Dea is considered metaphysically untenable. Metempsychosis: The soul is considered to be eternal and to move through various states of being before this life and after death. In accordance with the previous paragraph, there are no eternal hells, and even paradises are only temporary stations on the way to perfect Union with Dea. These states are determined by the werde of the soul, created by its spiritual choices. Whether or not this implies earthly "reincarnation" is not defined. What precisely is meant by the "soul" is also a subtle question, as Filianists believe the individual soul to be ultimately a fragment of Dea Herself. True and false self: Every Axial (e.g. human) being has a true and a false self. The True Self ultimately is one with Dea (Atma), while the false self is that which tends away from Dea. In everyday terms, this means that we are constantly confronted with choices that lead us toward the Light or toward the darkness. These choices make our werde. Divine origin and Harmony of Being: All things originate in Dea. The universe is not an "accidental" phenomenon, neither is it arbitrarily "created" or "designed". It is the external manifestation of the Divine Harmony. Human speech, for example, is the reflection of Angelic speech at a lower level. Angelic speech is the exteriorization of the Divine Word. What is your language of the earth, My children? What are the words of thy speech? Are they not fallen from the first, the mother language? Are they not broken and impaired? ...all sweetness is the far-blown scent of this Sweetness; and all Beauty is the pale and dimmed reflection of this Beauty; and all music but the faint and distant echo of this Music. Mental purity: The Filianic Sutra Thoughts of the Mind makes clear that what we think has real effects upon our psychic substance. Uttering impure words or subjecting oneself to coarse, impure or cruel media poisons the soul, just as ingesting unclean substances poisons the body. Impure and ugly things do not just go away after we have uttered, watched, or read them. They change us and damage us. Filianism is not in any sense an ascetic religion. It does not have proscriptions on eating particular foods or on drinking alcohol. It does not mandate fasting or other ascetic practices. It does, however, encourage mental purity: refraining from ingesting damaging fare into the soul or speaking in a coarse or profane manner. These things are not regarded as "sinful" but simply as harmful and to be avoided. For many Filianists this also extends to dressing in a manner in keeping with the beauty and dignity of an Axial being. This should not be confused with "modest dress" movement. The issue is not modesty but the inherent beauty and dignity of maidenkind as the "princess regent" of Dea on earth and a pure child of our Heavenly Mother. Of course dressing in a grotesquely immodest or sexualized manner would be out of keeping with that dignity and purity, but a concern with covering the body in the "modesty movement" sense is not the issue here, and most Filianists would agree that, for example, sleeveless dresses or short skirts are acceptable providing they are not undignified or deliberately sexualized. The Janyati: The Janyati (singular, Janya) have been translated as "Angels" or occasionally "Goddesses". Neither term is exact. These divine beings are seen as "pure streams that have their source in Dea". They govern all material phenomena. Probably the fullest and best reference to the Seven Great Janyati and the philosophy behind them can be found here. There are other Janyati beside the Seven, such as Sai Annya, the Janya of Fire. The Janyati are fundamental to Déanic philosophy. While the practice is not currently common, it is held that the worship of any Janya is a form of the Worship of Dea. Filianists and many Déanists observe a calendar with thirteen months of 28 days (the thirteenth month being counted as a fifth season). It has eight High Feasts and several minor festivals. Some of the festivals superficially resemble the Christian calendar, though Filianists say that this is because the Christian calendar itself is based on older and ultimately Déanic festivals in Europe. For example, there is no historical support even claimed for the idea that Jesus was born in midwinter, and the festival of Christmas is clearly simply a continuation of older midwinter festivals. A complete guide to the calendar and its festivals can be found here. • The Filianic Creed – The earliest and most concise statement of the Filianic faith, with an extensive commentary. This is the definitive guide to what Filianists believe. • The Gospel of Our Mother God – The Filianic Scriptures. • The Question of Faith – What "faith" means to a Filianist. • What Is Déanism? – The meaning and history of the term. • God as Mother FAQ – Answers all the main questions about the worship of God in purely feminine form. Send Questions or Comments on What Is Filianism?